A recent review article contained a graphic illustrating the life cycle of Theileria parva. 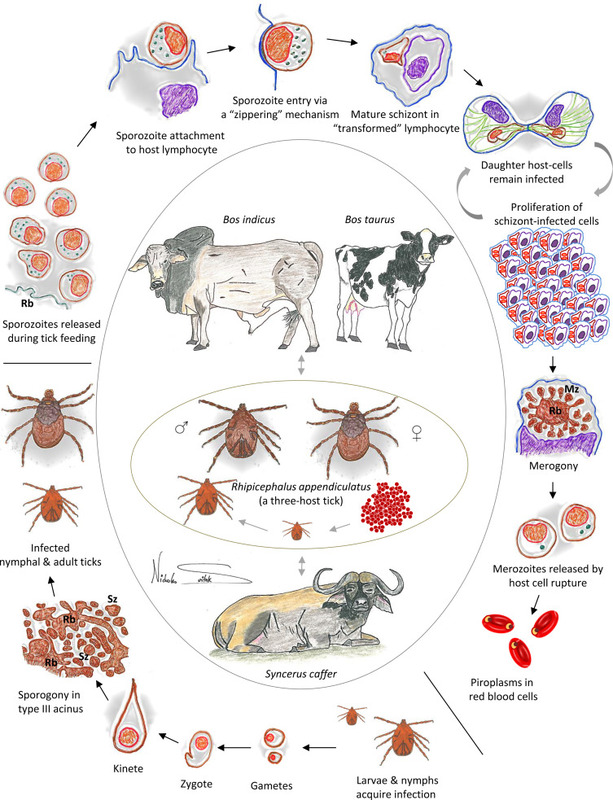 The figure illustrates the different life cycle stages of the parasite as it cycles through the mammalian and tick host. The figure was inspired by fluorescence and electron micrograph images of the parasite life cycle ( Fawcett et al., 1982a, Norval et al., 1992 and von Schubert et al., 2010). Stages of the life cycles are not drawn to scale. Sporozoites enter lymphocytes where they develop to the schizont stage, a process that results in host cell transformation resulting in clonal expansion of schizont-infected cells. The schizont stage is polyploid and multiple schizont nuclei are observed during host cell interphase. It is during the metaphase period of the cell cycle that schizont division occurs (Irvin et al., 1982). Some of the schizonts undergo merogony, giving rise to merozoites, which mature into the piroplasm stage in RBCs, and are infective to ticks. Tick larvae and nymphs acquire an infection by feeding on infected cattle or buffalo, and transmit the parasite as the next tick instar, nymphs and adults. There is no transovarial transmission of the parasite (reviewed in Norval et al., 1992). Kinetes, the final products of the sexual cycle, invade the tick salivary glands where sporogony occurs. Mature merozoites (Mz) and sporozoites (Sz) originate from a multinucleated residual body (Rb) during the process of merogony and sporogony, respectively. The vertebrate host cell nucleus is colored in purple and the parasite nucleus is in orange. Microspheres in sporozoites and micronemes in merozoites are depicted as small dark green dots inside the parasite. Host cell microtubules in the dividing schizont-infected cell are drawn in green. 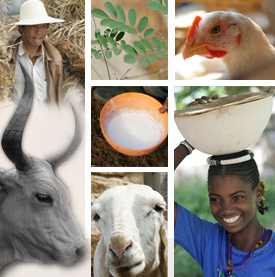 Drawings and artistic creation by Nicholas Svitek, a scientist at the International Livestock Research Institute.